I think that I need to start doing videos on all the mishaps that happen to me in my life. DZ: Morning, where is your boss? Me: Huh, My mother is in New York. Why are you asking about her? DZ: Before I beat you with a stick, can you just answer the question. DZ: Boy! Someone is monitoring this conversation! Me: And now they’ve seen that you threatened me with bodily harm. DZ: and you sexually harassed me. Me: Me? I’m not in a position of power to do such. You are senior to me so my case for harassment/assault is greater. DZ: I’m not senior to you… Wait.. Oh Sorry Stephan, Wrong window. I meant to message someone else. Me: So you were sitting at your desk thinking about me and subconsciously messaged? Now, to me, that was harmless flirting that did not break any rules or make anyone uncomfortable but you never know. If you are expecting a gift from brother Esteban, please know that a donation has already been made in your name to his credit card bill. On Monday, I will be in office alone as everyone else will be on vacation. Posting pictures from the beach or with a drink in your hand is not permitted. The Deacon Board has noticed that the Doubles man on Maraval Road has missed a day or two this week. If he doesn’t pay taxes, does he really need a day off? The church is reminded to avoid Sister Debbie’s black cake as it has been soaking in a bucket of rum since the beginning of December. The Young Ladies of the church are reminded to not accept any “Free Kisses” or “Free Hugs” Coupons from any young gentlemen in the church. The Lord’s love is enough to keep you til you die. If you know the brother or sister sitting next to you is alone this Christmas, please inquire if they would like company and only visit them in groups for 4. The Lord didn’t minister to you for any romantic hook up on this matter. If any of these announcements are confusing to you, might I suggest that you take it to the GOOD LORD in prayer and not with me! I’ve stopped expecting gifts for Christmas; mainly because of my age and also because I’m generally considered ungrateful when I get bad presents from people. If I see anybody that owes me money using an Iphone X, please know that I will not be confronting you but just passing by you and picking up stuff for auction. My housekeeper sent me a video from my laundry room of something that looked like rat droppings. I resisted the urge to tell her to pack my stuff up as I would be moving out. I’ve been spring cleaning over the last week and I can safely say that every box I’ve touched is now neatly packed and that I’ve thrown NOTHING away. Yes Ma’am I did hear you fart twice while you were doing your sit-ups in the corner. I assumed your music was on too loud so you think they came out without a sound. I see that you are back posting inspirational quotes under random pictures of yourself holding a drink/camera phone. STOP IT!! No one believes you as a motivational speaker! 1. Added some Chivas Regal to a batch of Black Sorrel I made and I think I woke up this morning with a slight hangover. 2. “COCO” is one glorious piece of animation. I still need to remember to take Claritin with me as I’m sure Movietowne has cleaned its air vents in a while. 3. I promised someone to try and stop being a hermit for 2018. 4. Saw different versions of Love this weekend. I need to start living my “best self”! 5. Cleaned out my fridge and discovered 12 containers of forgotten leftovers. One contained Cassava Pone. I haven’t made Cassava pone since April. 6. Part of my childhood memories died on learning of Shashi Kapoor’s death. 7. Just because three random strangers asked if I needed someone to wash my car doesn’t mean it’s dirty. It means they are looking for work. 8. I think my dogs need a “purge” (A cleanse/detox for the bourgeoisie). Are my nostrils supposed to clear up so quickly everytime I clean up mess in the yard? 9. I need to find a cooking class. Recommendations? No I don’t want you to cook for me. The mini prayer meeting I’m conducting every time I eat someone else’s cooking is taking its toll on me. 10. . The words “Ok Boss” tick me off to a point where I’m ready to strangle someone. 4. “Trouble” has been in the yard for an entire week. Something’s coming and I don’t think I’m ready for it. 9. There are times after I’ve paid all my bills that I consider opening up a “Go Fund Me” page so that I can have a life. 12. As bad as “The Orville” is (w.r.t. Sci Fi), it’s still miles ahead of anything Tyler Perry could produce for TV. 13. TV IDEA: In the style of the Greenleaf TV series, we should have a similar one call “Cuffie”. They already have the Palatial Residence and a Trini sized Mega Church, so it would be easy to make. Have you seen someone you hadn’t seen in ages and all of a sudden a repressed memory re-surfaces and scares you? In a Galaxy far far away. In a time where Gods roamed amongst us, there was a young lad that was loved by all and was always invited to every event possible. That no longer happens to the person but he isn’t bitter or angry with these so –called friends and their “married people/couples limes” with the multiple of…… . Sigh ok I’m digressing here and sounding bitter. Focus!! Anyway, in this alternate universe, he was invited by a co-worker to a celebratory event at his home. (I’m being vague here just so that anyone familiar with the event will have a hard time recalling same). The event was of a Thanksgiving nature. His parents were celebrating the success of all of their children completing tertiary education, some with multiple degrees. Now, I wasn’t the only one from the office that was invited but most everyone else decided to carpool. I opted to drive there on my own. Anyway I got there at a decent time and mingled with everyone but stayed mainly within the confines of the people that I knew. The speeches started an hour later and began with the Patriarch speaking on behalf of the family and listing out the accomplishments of the children. There were loads of cheers and toasting at this point. Then a close family member came up to speak and he also echoed the sentiments of the father and then added the gem of a phrase that this family always made the :indigenous choice” when it came to finding companionship. I jumped slightly at the phrase “indigenous choice” but smiled it off and toasted like everyone else. Each of the children spoke afterwards and basically thanked their parents for instilling the proper work ethic and values within them. That part was hella touching. Then came the fiancé of one of the siblings who spoke and proclaimed how happy he was to be invited into the family and how much he was in love. Before he ended his speech, he uttered “Oh and as you can see, she made the indigenous choice”. A loud deafening boom entered my ears and pervaded my mindscape. Everyone else laughed and some howled with laughter. Well I grinned and for the first time I quickly surveyed the room and realized that…. Gulp.. I was alone. There was no one else like me there. I looked at my co-workers and realized the same thing. I was the only one! No one else there was as “handsome” as I. Why would they single me out to attend this event? 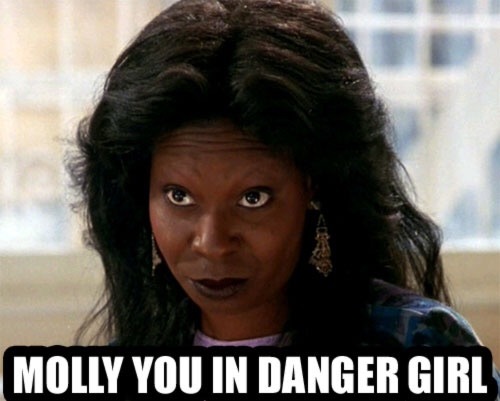 Then the voice of Oda Mae Brown filled my head : Molly, you in danger, girl! I will not say that I departed immediately but I began to feel slightly uncomfortable even though everyone I spoke to at the event acted normal and to a large extent was only laughing at my jokes. So when the speeches ended and the food was served (yuh must be mad to think I was leaving there hungry), I hung around for another half hour and then feigned a previous commitment (having to pick up my mother and sister from an alleged prayer meeting) and left. I never spoke about my feelings/fears to anyone from work, but I mentioned the awkwardness to a couple people and was told that I was being my usual paranoid self. When you need to visit Pennywise but you didn’t walk with your passport to go beyond the Lighthouse in Port of Spain and you are in no mood to mix with the people on Charlotte Road. Mentally shutting down when someone uses the argument that “conversate” is in the dictionary. So are curse words but I don’t have to use them to get my point across. Thinking lowly of anyone using the word “Stush” to describe their life and adventures.